From 7 August-4 September 1929, the Graf Zeppelin (LZ-127) made a round-the-world flight beginning in Lakehurst, NJ. 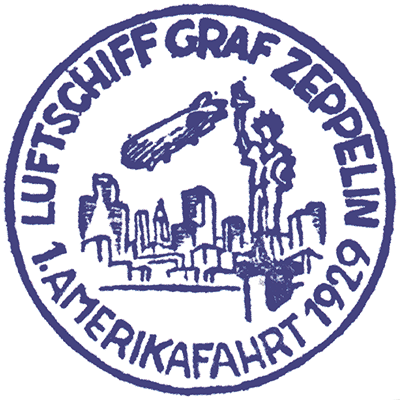 The Graf Zeppelin flew east to Friedrichshafen, then to Tokyo, Los Angeles, Lakehurst, and back to Friedrichshafen. 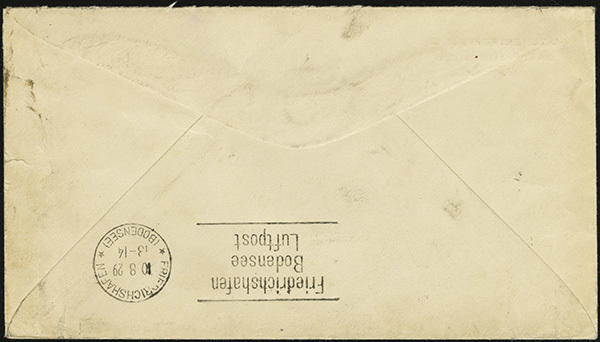 Due to the volume of mail and the number of stops, numerous cancels and cachets exist. 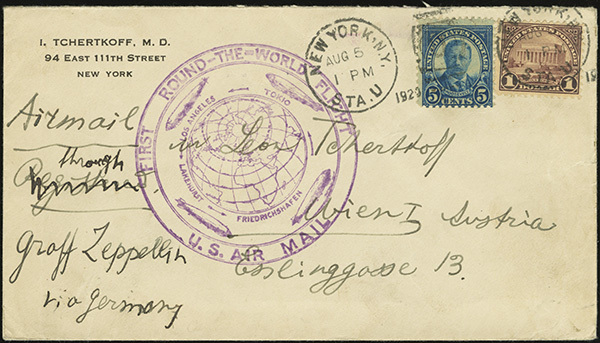 Mail loaded in Lakehurst bears a purple confirmation stamp. 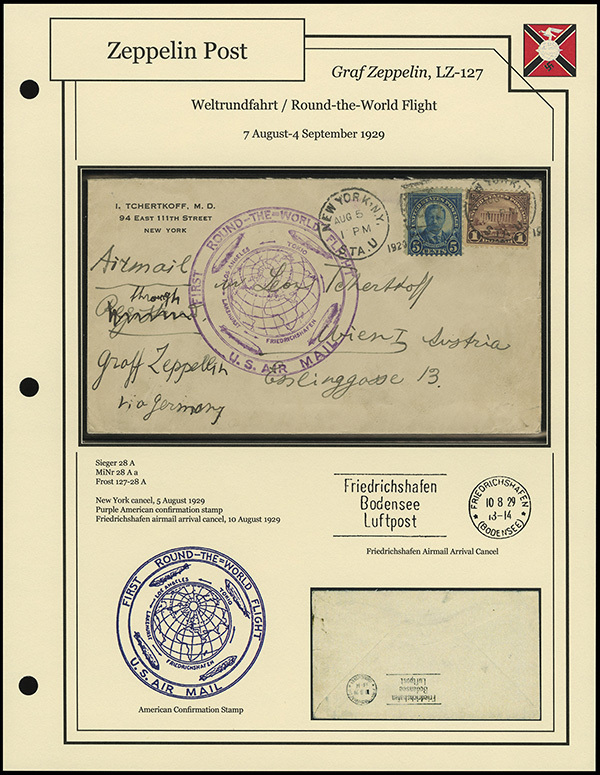 The largest quantity of mail (25,059 pieces) was loaded in Lakehurst and dropped at the first stop on the trip, the first Friedrichshafen landing on 10 August 1929. Much of this mail received an arrival cancel from Friedrichshafen. Here are a couple new additions from the 1930 Netherlands Flight previously seen here. This copy of Sieger 98 Aa is from a connecting flight. 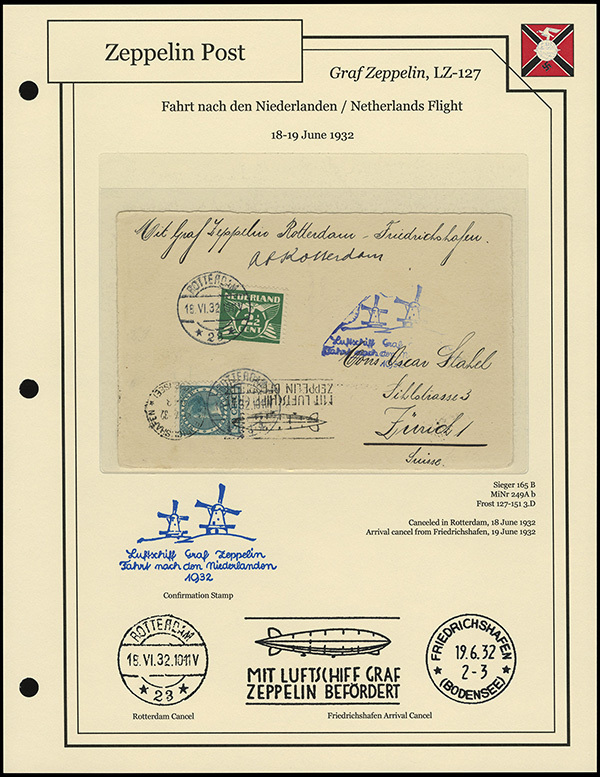 It was initially mailed in Triesenberg, Liechtenstein, and was loaded on-board in Friedrichshafen. This copy of Sieger 98 Ab was canceled on board. 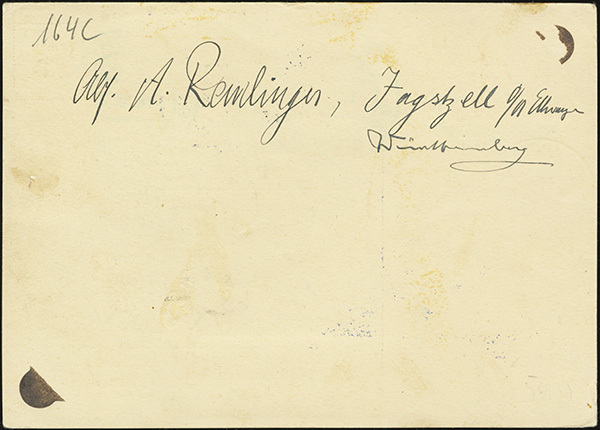 It was sent to Newport, Rhode Island, and the recipients address is actually given in a round, blue cachet. 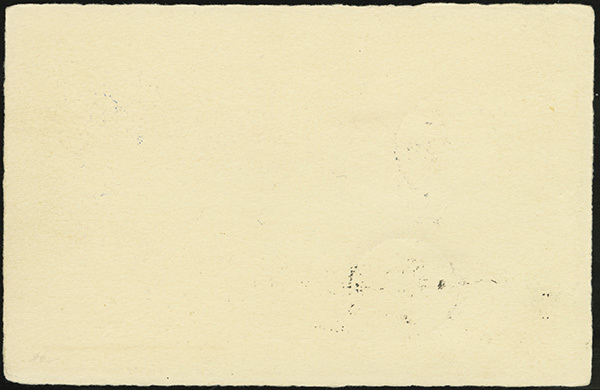 It bears transit cancels from New York. Your Zeppelin posts continue to Impress me! 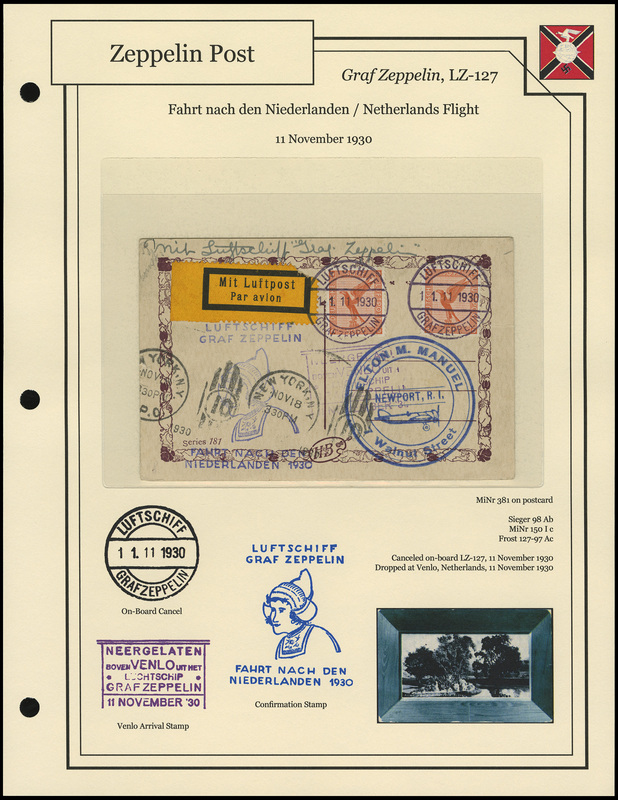 And a couple new additions from the 1932 Netherlands Flight previously seen here. 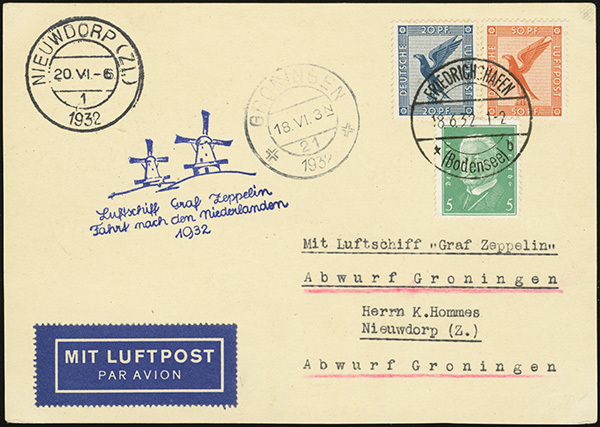 This postcard has an on-board cancel, and was not dropped in the Netherlands, but ended with the flight in Friedrichshafen. 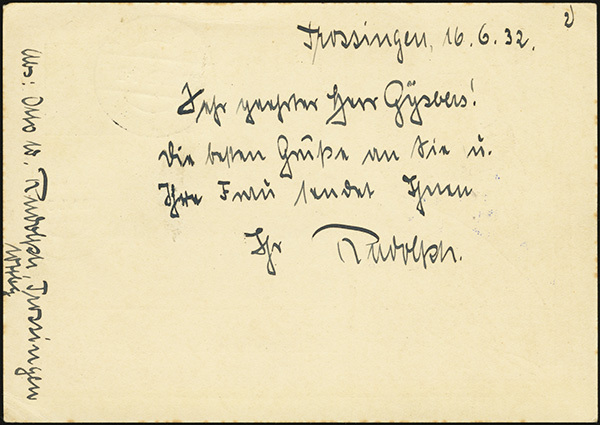 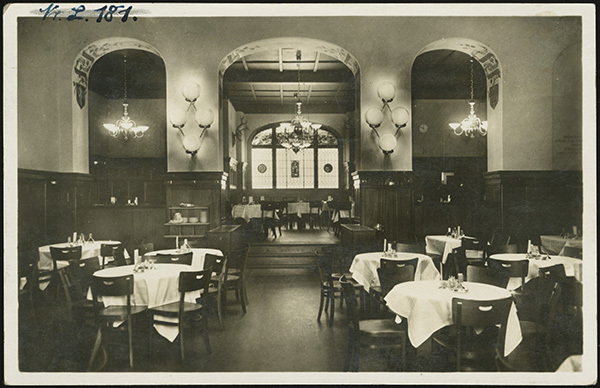 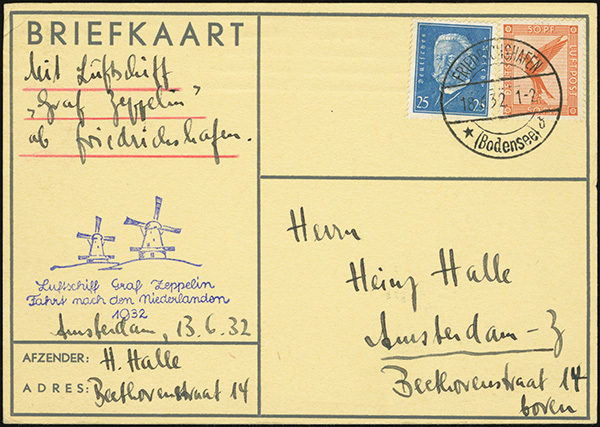 This second postcard was posted in Rotterdam, Netherlands, and made the return flight to Friedrichshafen. 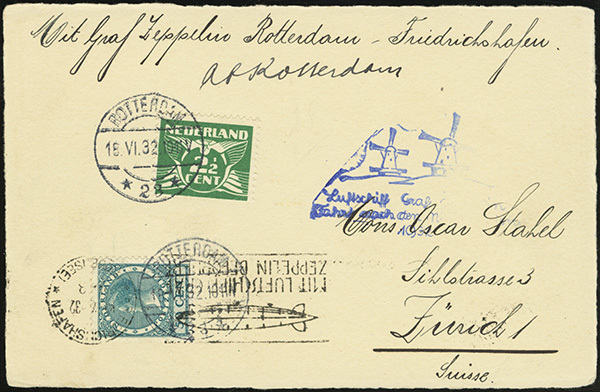 In Friedrichshafen, it was stamped with a new Friedrichshafen arrival cancel. 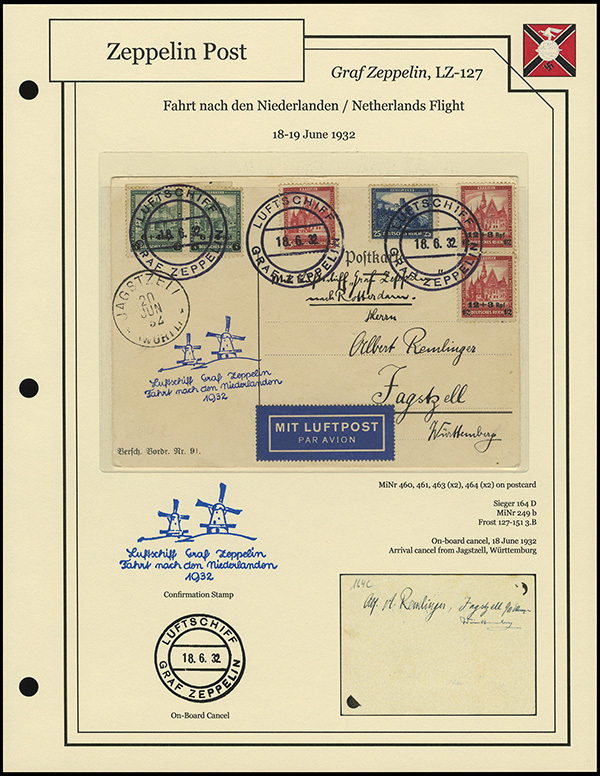 This flight was its first use. 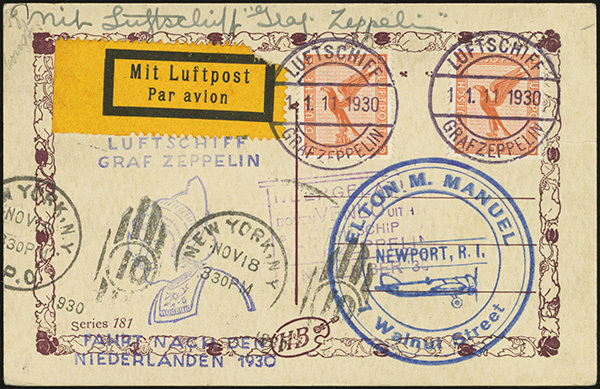 Here's another from the Graf Zeppelin's first North America flight of 1929, previously shown here. 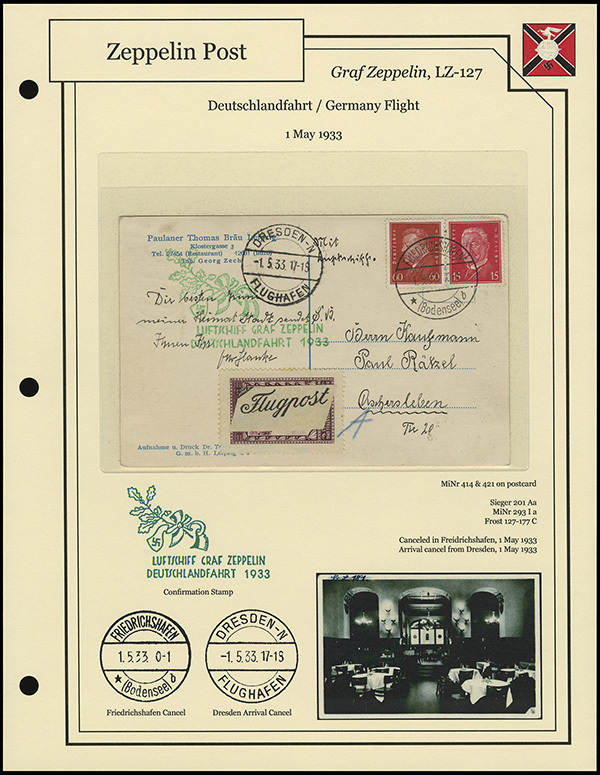 This cover bears a machine cancel from Friedrichshafen. 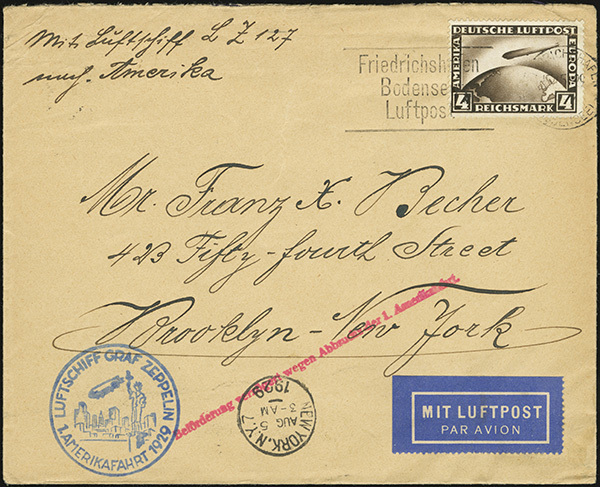 It also has an arrival cancel from New York. 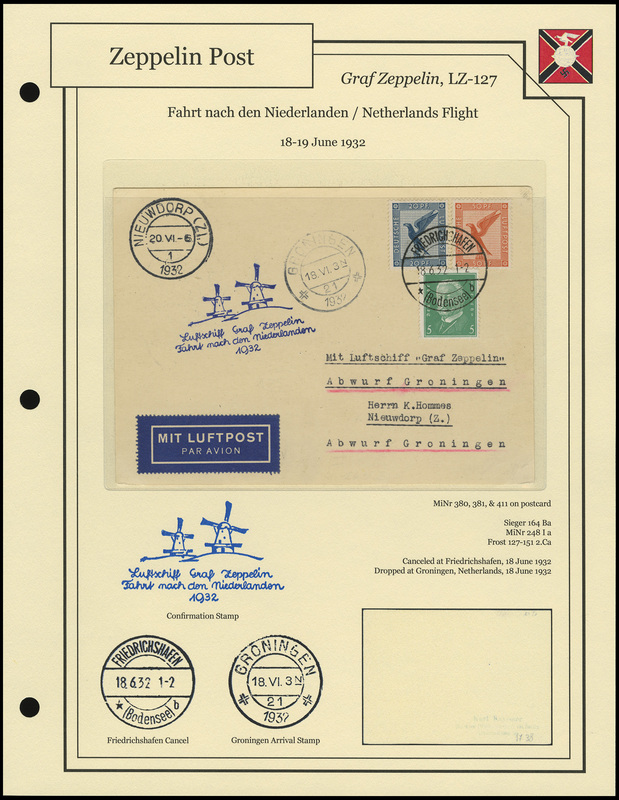 It also has the red interruption of flight cachet and blue flight cachet. 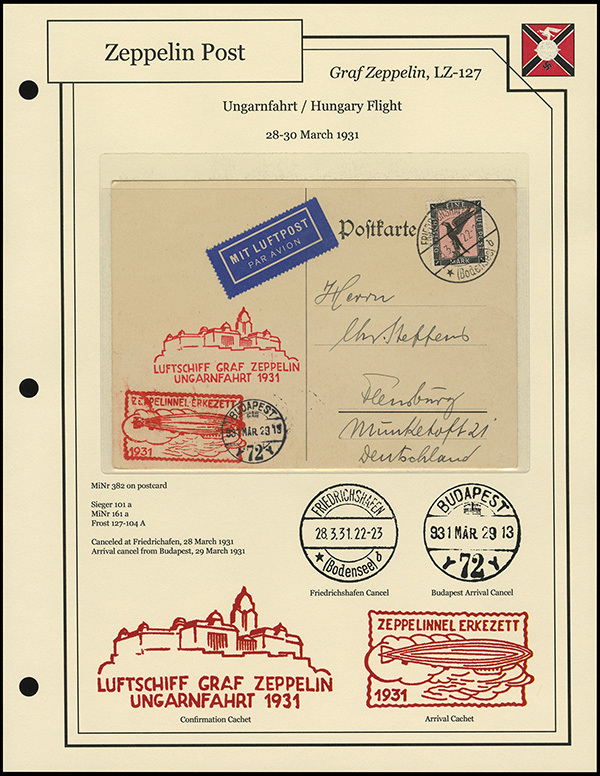 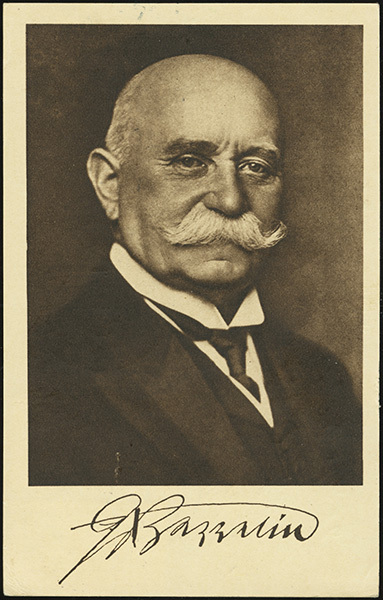 On 1 May 1933, the Graf Zeppelin (LZ-127) made a long, 2,200 km flight around Germany, leaving at just after midnight and landing at just after 10 P.M.
Mail carries cancels from either Friedrichshafen, on-board, or several treaty states. 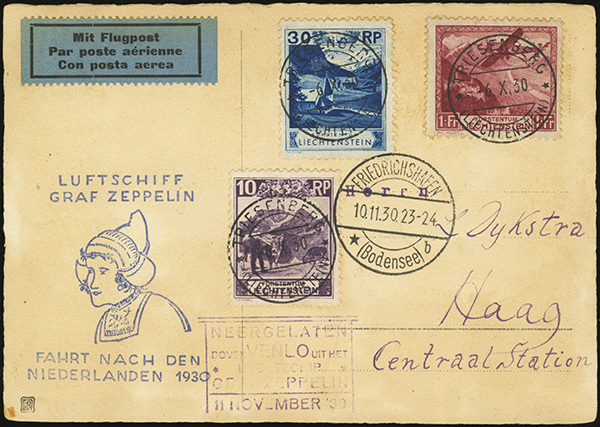 A single mail drop was made at the Dresden airport. 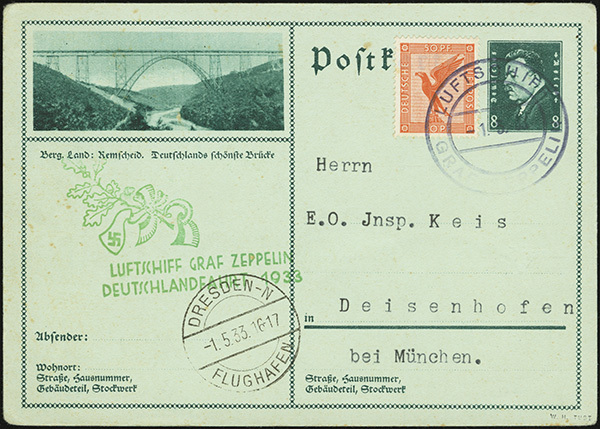 Mail dropped here should bear a Dresden Flughafen arrival cancel with a time of 17-18. 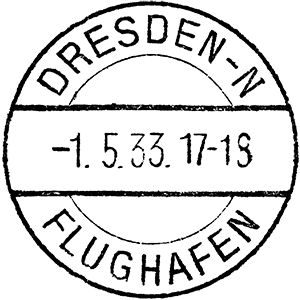 Copies do exist with an incorrect time, 16-17. All mail carried on this flight should have a green confirmation stamp. 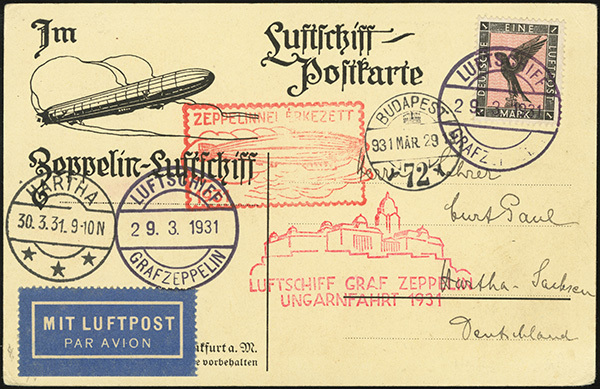 On 28 March 1931, the Graf Zeppelin (LZ-127) departed Friedrichshafen for Budapest. It landed in Budapest on the morning of 29 March, made a 9-hour round-trip flight over Hungary, then departed Budapest the same afternoon, arriving at Friedrichshafen on the morning of 30 March 1931. 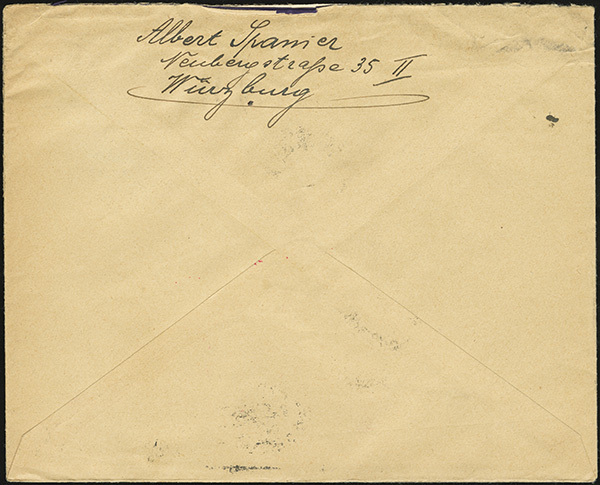 Mail transported bears a cancel from Friedrichshafen, on-board, or one of nine treaty states. 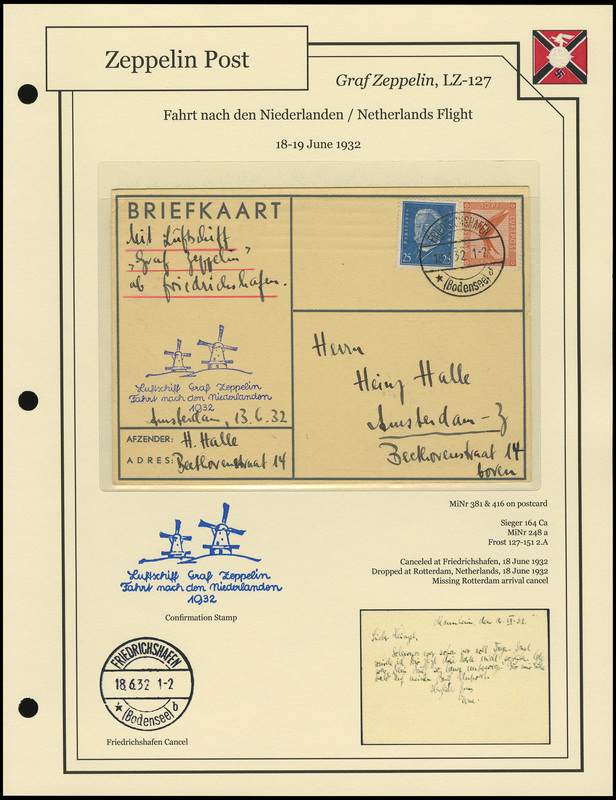 All mail also carries a red confirmation cachet and a red arrival cachet. 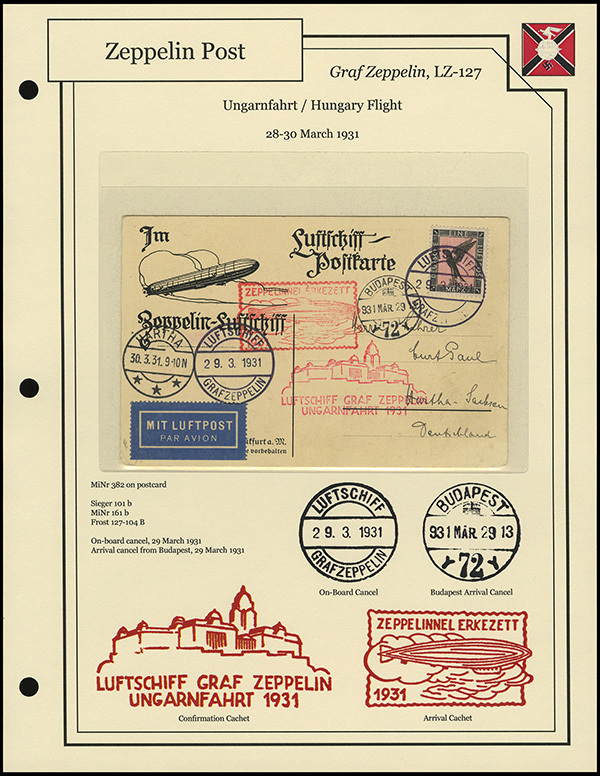 Mail from the Friedrichshafen-to-Budapest leg bears a Budapest arrival cancel. 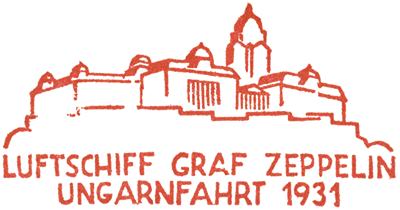 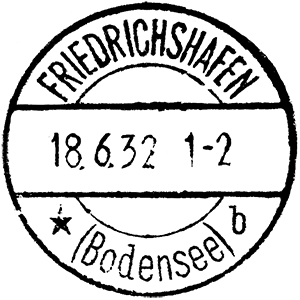 Another one from the 1933 Deutschlandfahrt, originally shown here. 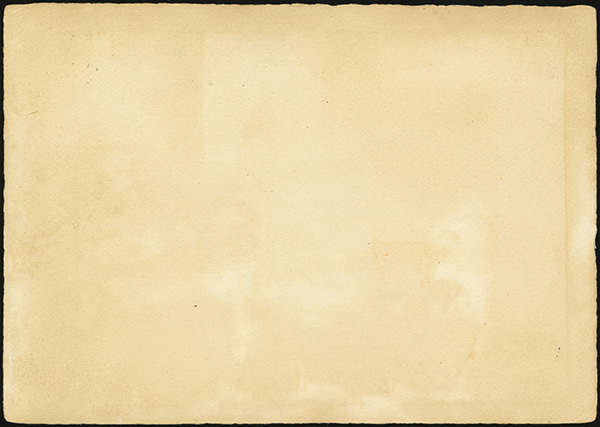 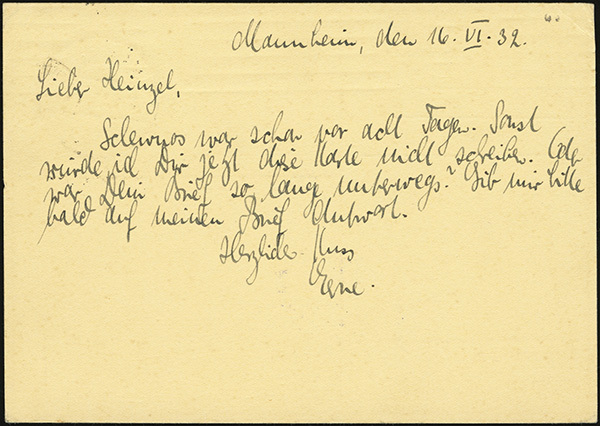 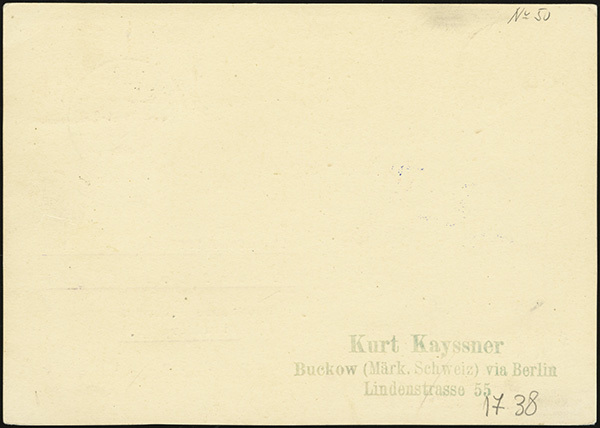 This card was posted on-board the Graf Zeppelin, and unloaded when the flight terminated in Friedrichshafen. 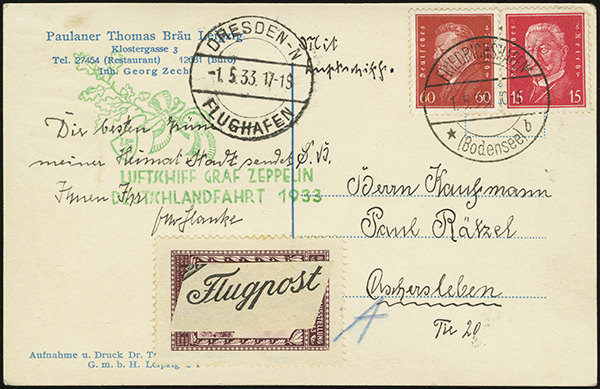 Mail unloaded in Friedrichshafen was stamped with a Friedrichshafen arrival cancel. 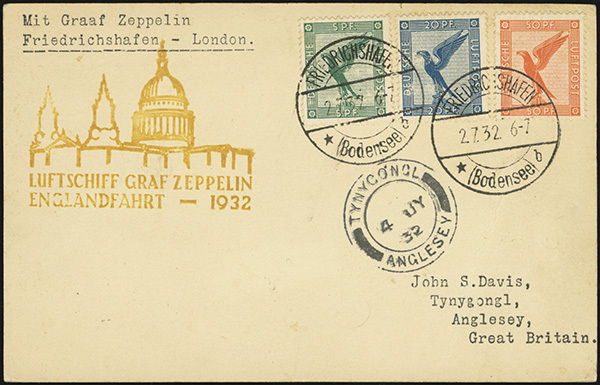 On 2 July 1932, the Graf Zeppelin (LZ-127) departed Friedrichshafen for London. 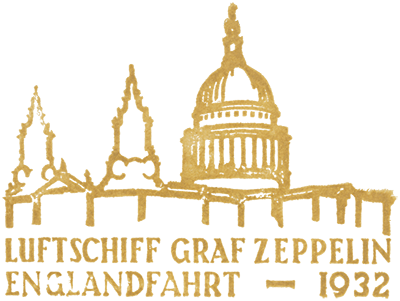 After arriving in London, the Graf Zeppelin made two local roundtrip flights before departing for Friedrichshafen, arriving on 4 July 1932. Mail carried on board typically bears a Friedrichshafen or on-board cancel. 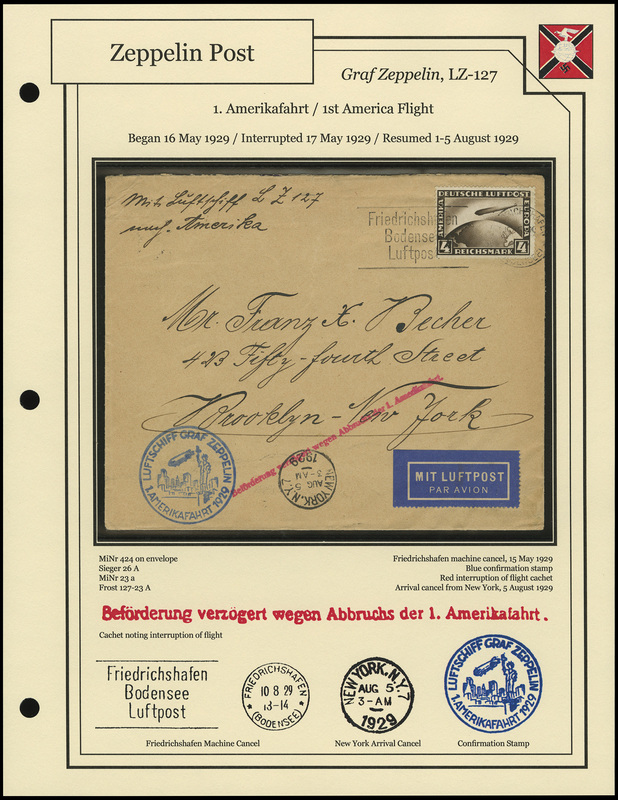 All mail also bears a gold flight cachet. 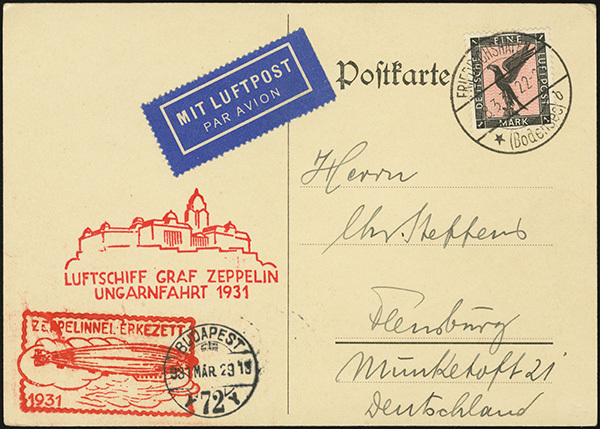 On 18 April 1932, the Graf Zeppelin (LZ-127) departed Frierichshafen for a round-trip journey to Recife, Brazil and back. 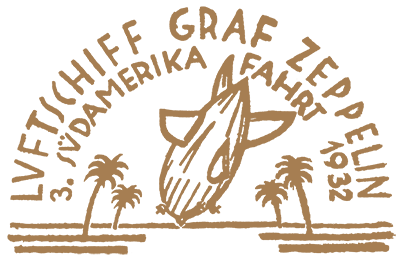 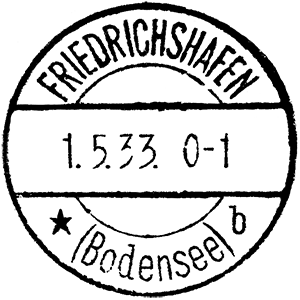 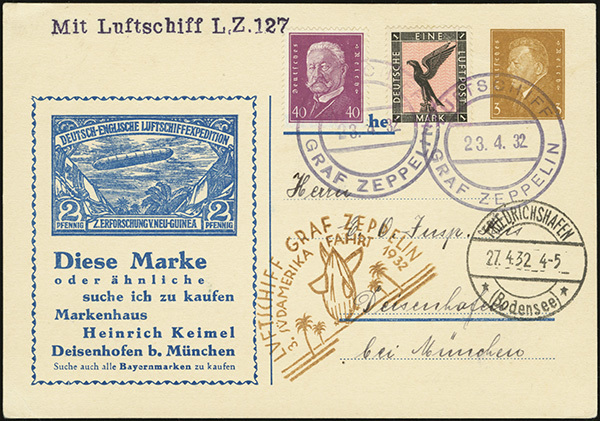 Mail from the outbound leg (17-20 April) is commonly canceled with a Friedrichshafen or on-board cancel. 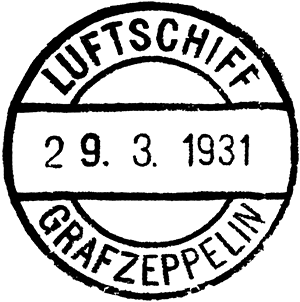 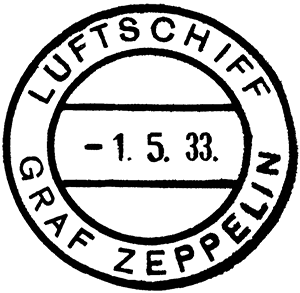 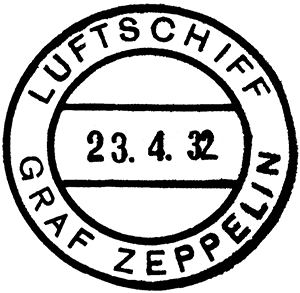 Mail from the return leg (23-27 April) is commonly canceled with either an on-board cancel, or one of a variety of cancels from South American countries. 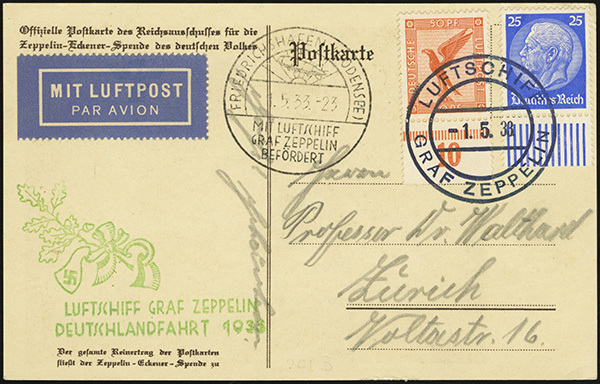 Mail offloaded in Friedrichshafen typically bears a Friedrichshafen arrival cancel. 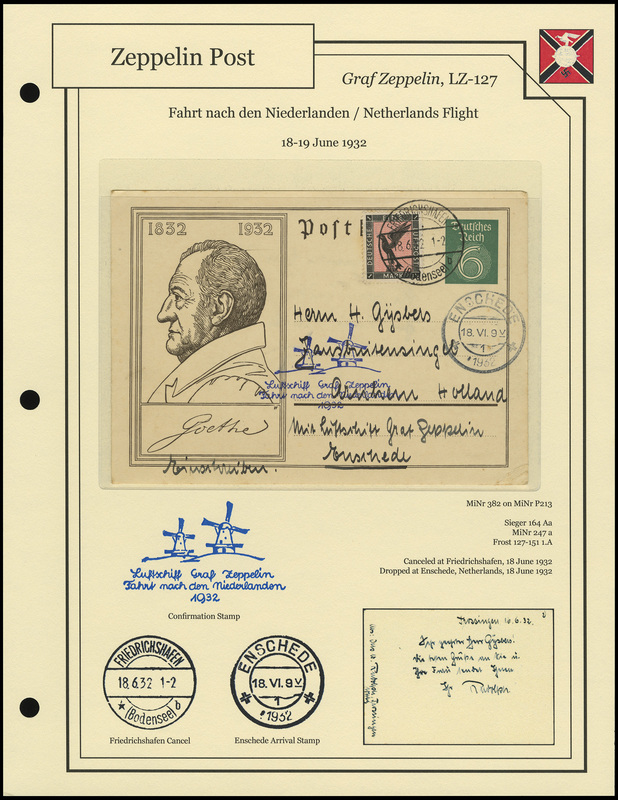 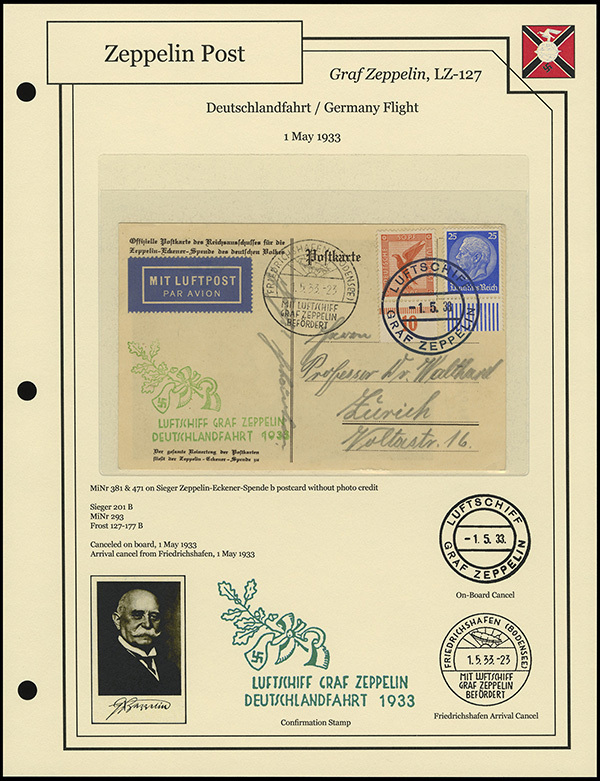 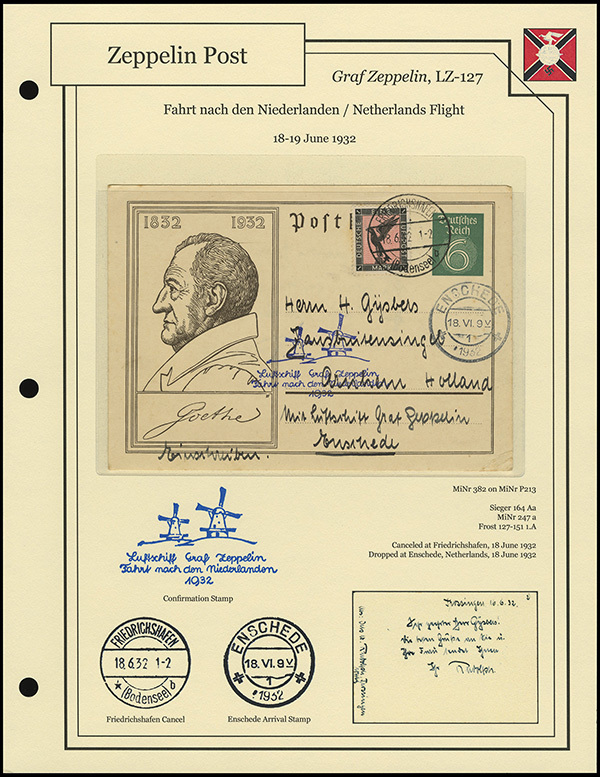 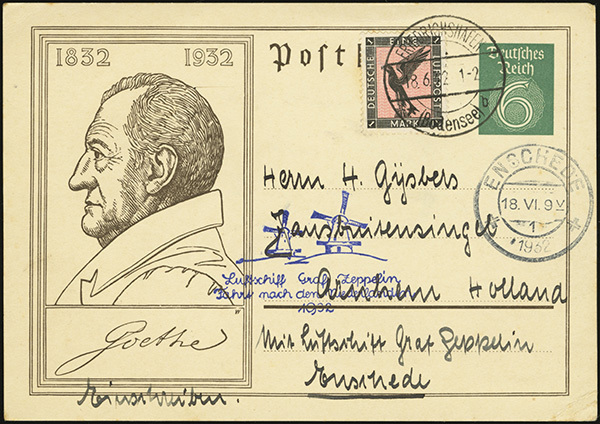 A special cachet was used on all German mail. 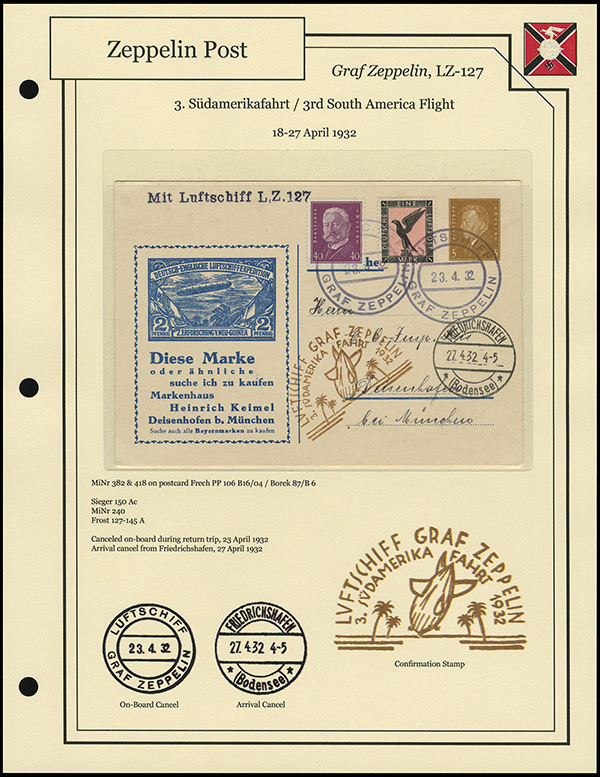 Separate cachets exists for South American origins. 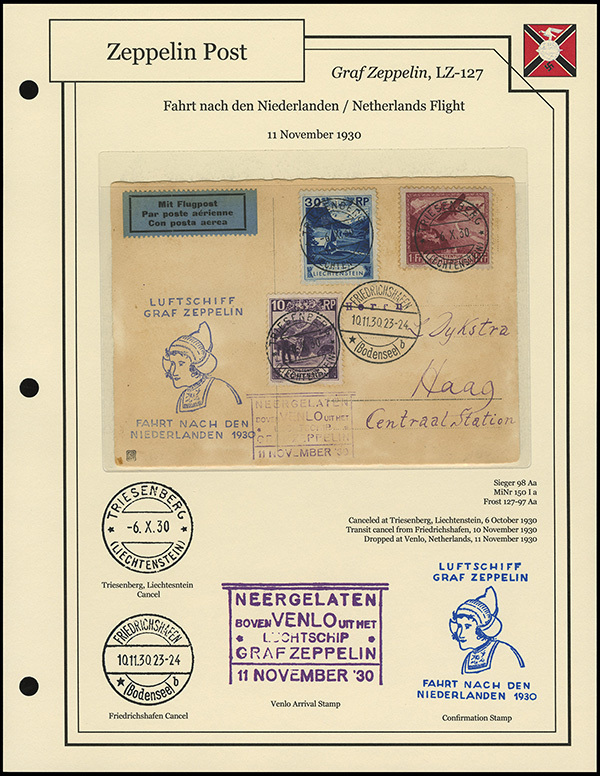 Here are a few more from the 1932 Netherlands Flight previously mentioned here. 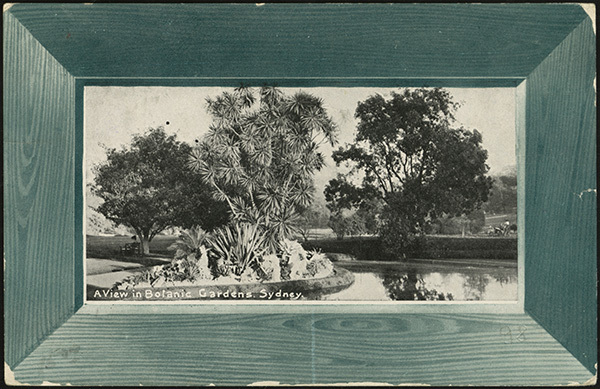 All album page images link to larger copies. 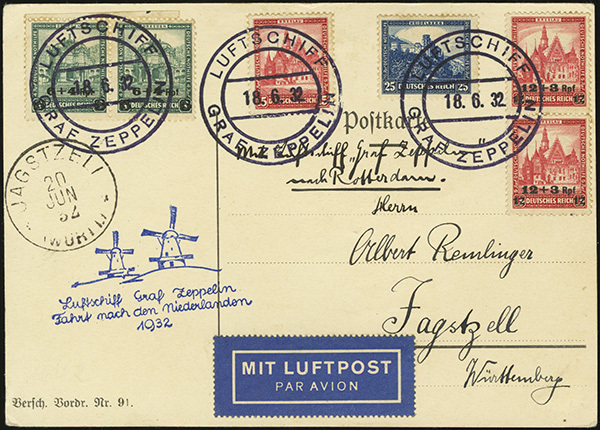 The previous cards shown in this thread were all either on-board cancels or Netherlands mail from the return flight. These three cards are from the outbound flight, but cancelled at Friedrichshafen rather than on-board. 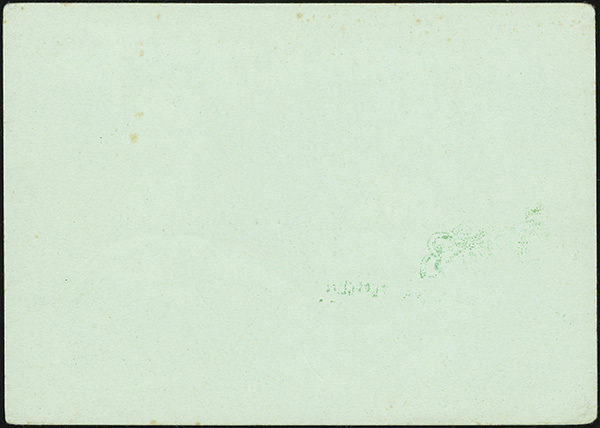 The primary difference in these three cards is the location at which each was dropped -- Enschede (Si 164Aa), Groningen (Si 164Ba), or Rotterdam (Si 164Ca). 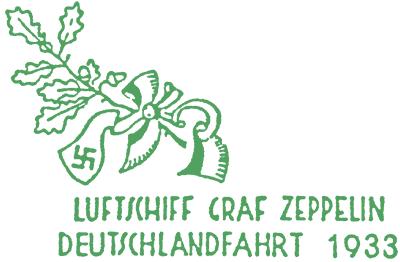 A very good topic a credit to you I have liked some posts but if I have missed any consider them all thumbs up. 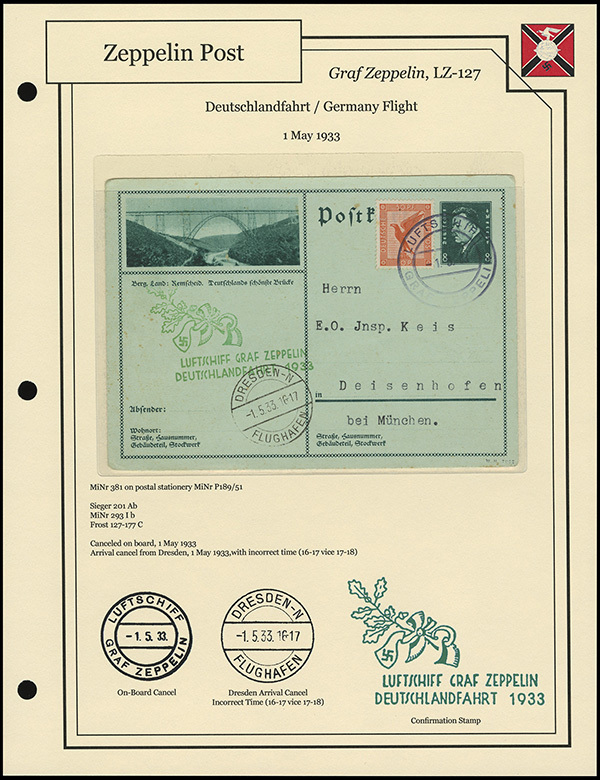 How do you find this kind of stuff ? 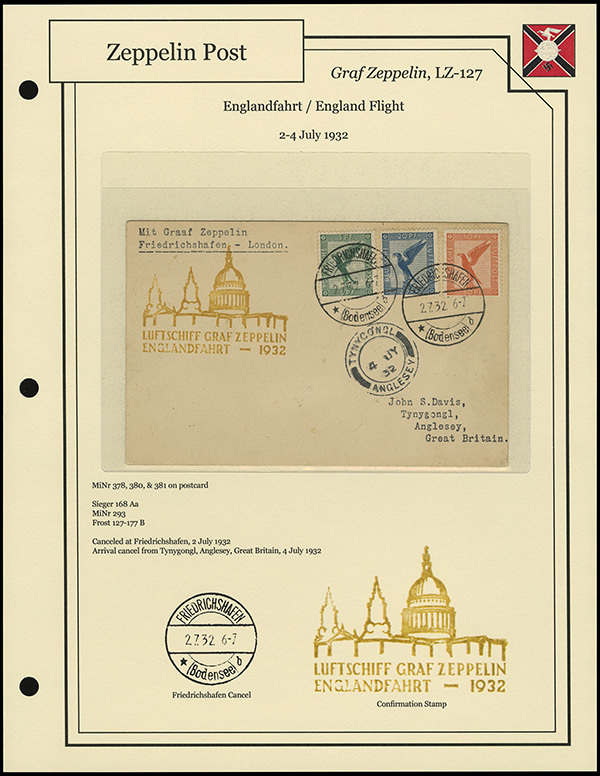 Most of these have come from eBay, with a few from larger auctionhouses or websites specializing in zeppelin items.